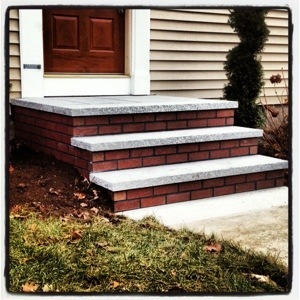 Here is a quick overview of how our granite and bluestone tread stairs are constructed. We begin construction of our stone tread stairs by to pouring a 5000 psi concrete inner core. The inner core is the foundation of the unit. This is what makes our stairs stronger and more durable than masonry “built in place” stairs. Once the inner core has cured, the stone treads and platform are installed. Next, the brick veneer is installed on the side and the face of the inner core. Once this is complete, all of the joints are filled with mortar, and cleaned. The final step before the stairs leave our yard is waterproofing. 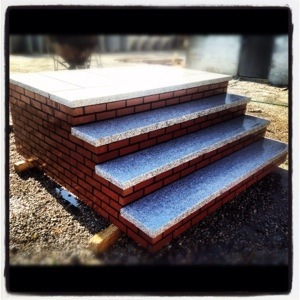 All of our steps are waterproofed before they leave the yard. If there are railings sold with the stairs, they are installed once the stairs are on the house. The railings are secured to the stairs with a fast setting anchoring cement. To see more information on what you can do to get the maximum life out of our stairs see the blog post on maintenance. To see more on how the stairs are installed see step installation.